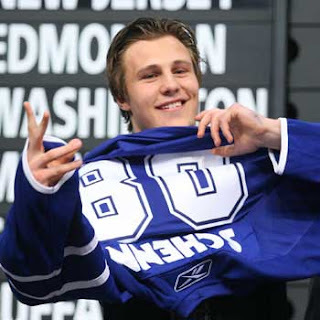 In the 2008 NHL Draft, the Toronto Maple Leafs had the 5th overall pick. They selected Luke Schenn who has been a pretty solid stay at home D-man. He can make some big hits and doesn’t give the puck up that often in his own zone. I personally didn’t like the pick as most of friends know. I don’t think you take a stay at home defenceman in the 1st round and should always try and take the guy with the biggest offensive upside that early. I think the Leafs were just worried about screwing up and took a safe pick. Schenn is a Canadian boy and has the size and tools to be a decent NHL player. They didn’t want to take a risk on a flashy player like Nikita Filatov, and as of right now it looks like a good move. But now looking at the Leafs roster they are pretty solid on the back end and have a lot of holes up front, especially at centre. If you could do that draft again for what the Leafs really need now. Who would you take? This is how the 2008 Draft unfolded and includes the players stats to date. Here are some of the players that stand out and make you wonder what they would look like in a Maple Leaf uniform, or if they would be playing more. I’m not saying I would take these young studs over Luke Schenn, but it’s interesting to think if some of these players could be having a bigger impact in the NHL if playing for the Toronto Maple Leafs. Has the size and skill to be a great power forward. Starting to put up offensive numbers in the NHL. Lighting up the AHL big time. Haven’t seen much from him since his hat trick in his first NHL game. But still a solid offensive prospect. Any of these guys you'd rather have than Schenn? Defencemen and Goalies will be reviewed tomorrow. But if the leafs were smart and had 2 first rounders. Like the Flyers did when they got Richards and Carter in the same draft. That is how you change your franchise around. If you are a NON playoff team you sould always be keeping your 1st pick and looking to add others. Just think if we had 2 middle round 1st's that draft and got Tyler Myers and Jordan Eberle.